You will have all Winter ahead of you so you can put aside some cash for a really amazing vacation in some exotic place next year. To help you our deal hunters have brought a freshly found Vancouver to Bali flight for $1,081 r/t with taxes included. Book a fare with China Southern Airlines and pay $100 less for your ticket than with any other airlines. Select 3-4 providers from the box for price comparison and choose the cheapest Bali flight that you can find. Keep in mind that the featured offer was provided by FlightHub but we have found it on Travelgrove. Depart on your trip to Indonesia from Vancouver International Airport (YVR) on March 10 and returns one week later from Ngurah Rai International Airport (DPS). The flight has a 1 hour 245 minutes one 5 minutes stop in Guangzhou on its way to Bali and a 7 hour 45 minutes one on its way back. China Southern Sky Pearl Club will provide you with 17,126 award miles for booking this fare. 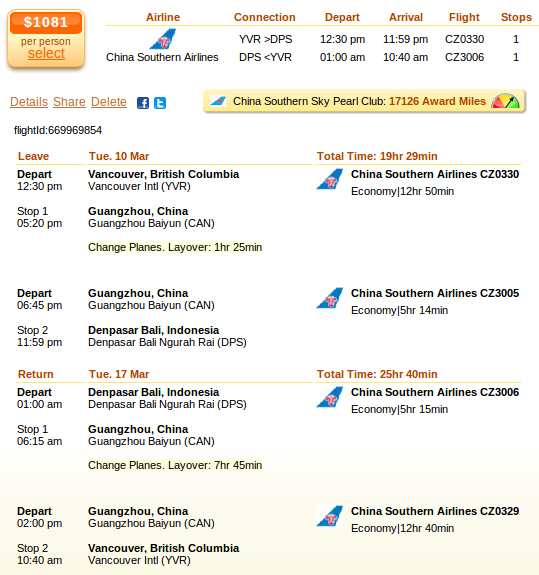 Check the table for the cheapest Vancouver to Bali flights and you will see that the China Southern Airlines fare is $100 cheaper than even the second cheapest deal we found. This entry was posted on Thursday, November 27th, 2014 at 7:17 am and is filed under Airfare Deals. You can follow any responses to this entry through the RSS 2.0 feed. You can leave a response, or trackback from your own site.